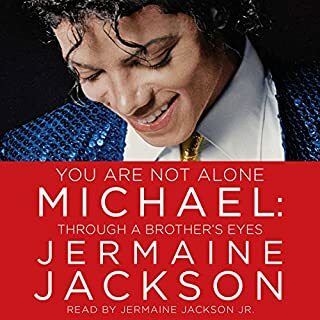 Narrated by: Jermaine Jackson Jr.
Jermaine Jackson—older than Michael by four years—offers a keenly observed and surprisingly candid memoir tracing Michael’s life starting with their shared childhood and extending through the Jackson 5 years, Michael’s phenomenal solo career, his loves, his suffering, and his tragic end which sparked worldwide grief. It is a sophisticated, no-holds-barred examination of the man, aimed at fostering a true and final understanding of who he was, why he was, and what shaped him. What did you love best about You Are Not Alone? I enjoyed learning the details about Michael's from a family member and learning about the real person not what the media portrayed. What does Jermaine Jackson Jr. bring to the story that you wouldn’t experience if you just read the book? He knows the characters in the book and his voice is quite soothing. I haven't heard his voice since the miniseries and I was surprised. I think that he did a great job!! !